Our bodies are community spaces. We share the real estate we call our own with a profusion of microscopic companions who, cell for cell, outnumber us nine to one. This multicultural population inside us – our microbiome – is influenced, for good or ill, by what we eat. For instance, we now know that the bugs we consume in fermented foods such as sauerkraut and kefir can populate our gut, thereby improving our immunity and even protecting us from cancer. We have been actively encouraging small life forms to colonise our food at least since neolithic times. This practice has allowed us to enjoy tastier meals, loosen our inhibitions and keep food longer. But can the lessons from our long heritage of do-it-yourself cultural manipulation be applied beyond food to help us navigate cultural change in a wider sense? Dedicated to ‘fellow skeptics, rebels and iconoclasts who question prevailing wisdom and authority’, Sandor Katz’ Wild Fermentation is part memoir and part recipe book, interwoven with essays; a cookbook with a seductive, subversive undercurrent. It is structurally unorthodox, but then so is Katz’ lifestyle. He steps free, apparently effortlessly, from the constrictions of genre and convention in literature as he does in life. His writing is informative, vibrant and precise. You get the sense that, like his sauerkraut, it has been given time to mature between nurturing visits. Never was a book more pleasing to Roguszys, God of pickles – once worshipped by Katz’ Lithuanian ancestors – than this. The book is the expression of a passion – a ‘song of praise and devotion to fermentation’. Its stars are microorganisms, ‘our ancestors and our allies’. Katz teaches us how to capture them from the ether, harness them to enrich the flora within us and learn from them to strengthen the communities around us. He describes his ferments as wild because he likes to make use of the biodiverse cultures found in the air and in his ingredients, rather than rely on the homogenous strains that come from a packet. Katz wrote Wild Fermentation whilst enjoying improved health after ‘two years in the abyss of AIDS’. It is suffused with purposefulness, heightened sensory appreciation, humility, tender love for humanity and lack of inhibition – all seemingly intensified by an acute sense of being lucky to be alive. In the essays that bloom around the recipes, Katz explores his topic widely. While he is too sensible to believe in fermented food as a miracle cure-all, as a person living with AIDS and therefore compromised immune function, he is alive to the benefits of co-living with a healthy biodiversity of microbes. He points out, for instance, that hand sanitizers, so rapidly becoming ubiquitous, kill only weaker bugs, potentially allowing more harmful ones to thrive. But his love of fermentation goes beyond the practical. He seems seduced by the romance of becoming one with the environment, applying an open-door policy as much to the wild microbial populations that pass his lips as to the neighbours who come through the door of his shared Tennessee home on pot-luck lunch days. Religious practices and oral storytelling traditions from all over the world, Katz points out, are intertwined with fermentation-induced altered states. Ancient Mayan ceremonies included the consumption of a honey ferment called balché, whilst christianity associates the imbibing of fermented grapes with the magical notion of transubstantiation. Katz argues that the various kinds of culture – fermentation culture, the culture of plants and animals and the culture of human behaviour – are inextricably entwined. He presents fermentation as a model for life and social change, contrasting its ‘gentle and slow transformative mode’ with, for instance, the immediate, destructive effect of fire. Above all, he seeks to challenge the increasing sameness in our food and environment served up by big business. If we are not able to grow all our own food, we can at least honour our ancestral traditions and the life forces around us by nurturing, savouring and becoming one with our own local populations of wild microbes. All it takes is a flask of yogurt or a few bottles of nettle beer brewing on a shelf. Katz’ own eventual fermentation is something he has given thought to. 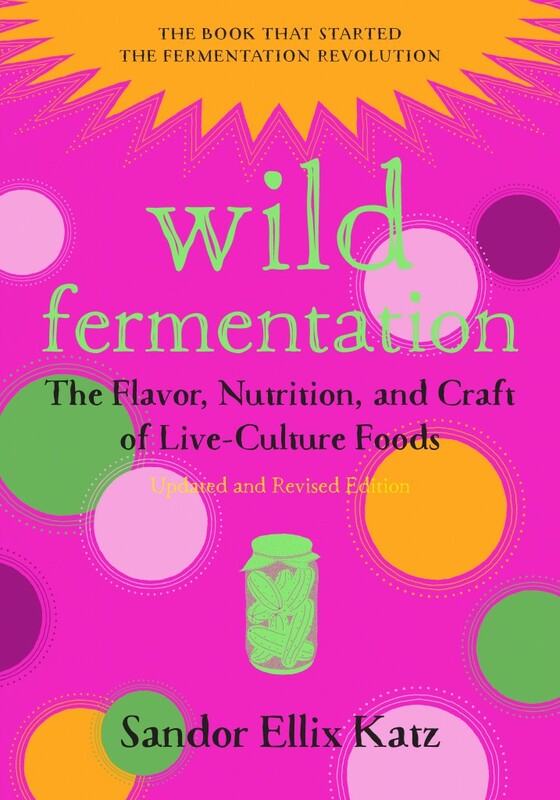 Wild Fermentation was first published by Chelsea Green in 2003 and revised in 2016.